The hippocampus is one of the most widely studied brain regions. Its basic functional role is hypothesized to be the encoding and retrieval of declarative memories. Hippocampal regions CA3 and CA1 have been proposed to be auto- and hetero-associators for the storage of declarative memories, respectively. David Marr was one the first to propose that hippocampus works like a contentaddressable memory (CAM) system. In his rudimentary model, neurons were simple threshold neuronal nodes and the synaptic weights were updated according to an iterative time quantized update scheme, providing a very rough insight into the dynamical processes in the hippocampus. Since then, a dramatic accumulation of knowledge about the morphological, physiological and molecular characteristics, as well as the connectivity and synaptic properties of excitatory and inhibitory neurons in the hippocampus have been witnessed (Cutsuridis et al., 2010a). Excitatory neurons are primarily pyramidal neurons and they constitute 90% of all neurons in the hippocampus, whereas the remaining 10% are interneurons, primarily inhibitory, which are classified according to their morphological, physiological, molecular and synaptic characteristics into other numerous subclasses. Collections of thousands of such cells then interact in cell assemblies (microcircuits), with each microcircuit being an individual machinery, which receives, processes and transmits information. Computational models play an instrumental role in providing clues on how these detailed properties of individual neurons give rise to the encoding and retrieval of memories in the hippocampus. 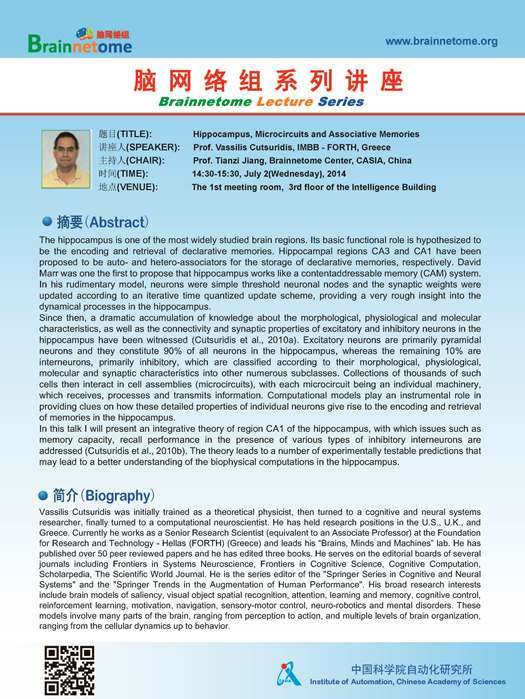 In this talk I will present an integrative theory of region CA1 of the hippocampus, with which issues such as memory capacity, recall performance in the presence of various types of inhibitory interneurons are addressed (Cutsuridis et al., 2010b). The theory leads to a number of experimentally testable predictions that may lead to a better understanding of the biophysical computations in the hippocampus. Vassilis Cutsuridis was initially trained as a theoretical physicist, then turned to a cognitive and neural systems researcher, finally turned to a computational neuroscientist. He has held research positions in the U.S., U.K., and Greece. Currently he works as a Senior Research Scientist (equivalent to an Associate Professor) at the Foundation for Research and Technology - Hellas (FORTH) (Greece) and leads his "Brains, Minds and Machines" lab. He haspublished over 50 peer reviewed papers and he has edited three books. He serves on the editorial boards of several Scholarpedia, The Scientific World Journal. He is the series editor of the "Springer Series in Cognitive and Neural;Systems" and the "Springer Trends in the Augmentation of Human Performance". His broad research interests include brain models of saliency, visual object spatial recognition, attention, learning and memory, cognitive control,reinforcement learning, motivation, navigation, sensory-motor control, neuro-robotics and mental disorders. These models involve many parts of the brain, ranging from perception to action, and multiple levels of brain organization, ranging from the cellular dynamics up to behavior.